Charles Atlas (born Angelo Siciliano; October 30, 1892 – December 24, 1972) was the developer of a bodybuilding method and its associated exercise program that was best known for a landmark advertising campaign featuring Atlas's name and likeness; it has been described as one of the longest-lasting and most memorable ad campaigns of all time. Atlas trained himself to develop his body from that of a "scrawny weakling", eventually becoming the most popular muscleman of his day. He took the name Charles Atlas after a friend told him that he resembled the statue of Atlas on top of a hotel in Coney Island and legally changed his name in 1922. He marketed his first body building course with health and fitness writer Dr. Frederick Tilney in November 1922. Tilney wrote the original course "Health & Strength by Charles Atlas," and the duo ran the company out of Tilney's home for the first six months. In 1929, Tilney sold his half of the business to advertising man Charles P. Roman and moved to Miami, Florida, where he operated a very successful health food business until his death in 1977. Charles Atlas Ltd. was founded in 1929 and, as of 2015, continues to market a fitness program for the "97-pound weakling" (44 kg). The company is now owned by Jeffrey C. Hogue. Angelo Siciliano was born in Acri, Calabria, Italy, in 1892. Angelino, as he was also called, moved to Brooklyn, New York at the age of 11 and eventually became a leather worker. He tried many forms of exercise initially, using weights, pulley-style resistance, and gymnastic-style calisthenics. Atlas claimed that they did not build his body. He was inspired by other fitness and health advocates who preceded him, including world-renowned strongman Eugen Sandow and Bernarr MacFadden (a major proponent of "Physical Culture"). He was too poor to join the local YMCA, so he watched how exercises were performed, then performed them at home. He attended the strongman shows at Coney Island, and would question the strongmen about their diets and exercise regimens after the show. He would read Physical Culture magazine for further information on health, strength, and physical development, and finally developed his own system of exercises which was later called 'Dynamic Tension,' a phrase coined by Charles Roman. A bully kicked sand into Siciliano's face at a beach when he was a youth, according to the story that he always told. At this time in his life, also according to the story, he weighed only 97 pounds (44 kg). However, an early Atlas brochure from 1924 showed a 1903 picture of a small, thin Angelo Siciliano dressed in clothes for the period, including traditional knickerbockers. In later editions of the brochure, Angelo's age was changed to 15. According to several stories and claims, he was at the zoo watching a lion stretch when he thought to himself, "Does this old gentleman have any barbells, any exercisers?...And it came over me....He's been pitting one muscle against another!" None of the exercises in the Dynamic tension course could be attributed to an African big cat, but other exercise courses of the time contained exercises similar to Atlas's course, particularly those marketed by Bernarr McFadden and Earle E. Liederman. Were they all inspired by stretching lions at the zoo? He concluded that lions and tigers became strong by pitting muscle against muscle. 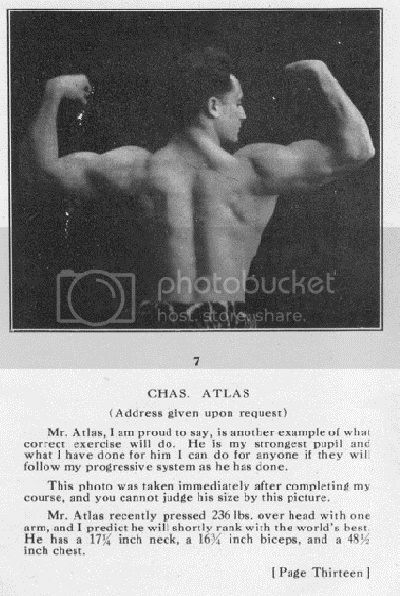 In 1922, 30-year-old Siciliano officially changed his name to Charles Atlas, as it sounded much more American. He met Dr. Frederick Tilney, a British homeopathic physician and course writer who was employed as publisher Bernarr MacFadden's "ideas man." Atlas and Tilney met through MacFadden, who was using Atlas as a model for a short movie entitled "The Road to Health." Atlas wrote a fitness course and then asked Tilney to edit it. Tilney agreed and Atlas went into business in 1922. Tilney himself had an extensive background in weight training. Atlas was described as a student of Earle E. Liederman in several editions of a Liederman booklet, until shortly before the Dynamic Tension course was published. The 1918 edition of the booklet states that Atlas had performed a one-arm overhead press with 236 lb. The 1920 edition states a 266 lbs one-arm overhead press. However, Atlas/Siciliano was already a strong, well developed man before being featured in Liederman's magazine. 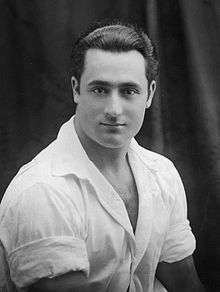 "In April of 1924, (David P.) Willoughby staged a "National" weightlifting championship, which was also supposed to serve as a basis for selecting an Olympic Team to represent the United States at the upcoming Paris Olympic Games (no team was ever sent to Paris). In the meantime, Jowett joined the staff of Calvert's Strength magazine and began, with Calvert, to push the ACWLA. The ACWLA was also reorganized, with Jowett as president, Coulter and Willoughby as vice presidents, and an advisory board that included Charles Atlas, Bernard, Calvert, Earle Leiderman, Charles MacMahon, Bernarr Macfadden and Henry Titus (many of the major players in the Iron Game at that time). Jowett was to be the editor of Strength magazine from 1924 to 1927 and that position, along with his energy in it, made him the most powerful voice for the organization of weightlifting in the United States at that time. He staged a number of competitions and the first ACWLA governance meeting (in late 1924). At that meeting, issues such as the lifts to be contested were agreed to." 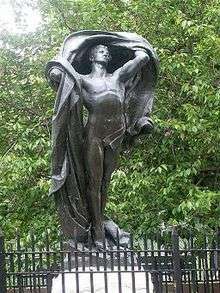 Besides photographs, Atlas posed for many statues throughout his life. These included Alexander Stirling Calder's Washington at Peace (1917-18) on the Washington Square Arch, Manhattan; Pietro Montana's Dawn of Glory (1924) in Highland Park, Brooklyn (sometimes misreported as Prospect Park); and James Earle Frazer's Alexander Hamilton (1923) at the U.S. Treasury Building in Washington, D.C.
Atlas began to experience chest pains after exercising. In his final years, Atlas developed diabetes and was placed on a high protein diet by his doctors to offset the effects of the disease. This led to his arteries being clogged and resulted in his hospitalization. He died on December 24, 1972 in Long Island Memorial Hospital. He left behind a son, Charles Jr., and a daughter, Diana. His wife, Margaret, had predeceased him seven years before. There is no evidence of heart trouble in the Atlas family. Santos Siciliano, Atlas' father, who had returned to Italy shortly after arriving in the USA in 1903, lived into his 90s. Atlas' son, Charles Jr., died in August 2008 at the age of 89. 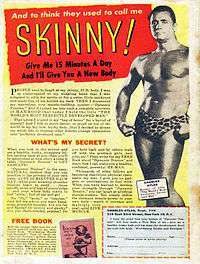 The famous Charles Atlas print advertisements became iconic mostly because they were printed in many comic books from the 1940s onwards – in fact continuing long after Atlas' death. The typical scenario, usually expressed in comic strip form, presented a skinny young man (usually accompanied by a female companion) being threatened by a bully. The bully pushes down the "97-pound weakling" and the girlfriend joins in the derision. The young man goes home, gets angry (usually demonstrated by his kicking a chair), and sends away for the free Atlas book. Shortly thereafter, the newly muscled hero returns to the place of his original victimization, seeks out the bully, and beats him up. He is rewarded by the swift return of his girlfriend and the admiration of onlookers. The children's book, Strong Man: The Story of Charles Atlas written and illustrated by Meghan McCarthy, tells the story how a "97-pound weakling" who was picked on by neighborhood bullies developed into Charles Atlas, "the World's Most Perfectly Developed Man". The band A.F.I. have a song called "Charles Atlas" on their album Very Proud of Ya. The The Bonzo Dog Doo-Dah Band song "Mr Apollo" is a parody that includes the lines "Five years ago I was a four-stone apology ... Today I am two separate gorillas!" In an issue of the DC Comics title Mystery in Space, the main character, Comet, referring to an army of super-powered clones, says, "Physically those clones may make me look like a 98-pound-weakling, but psychically I'm the Charles Atlas of this beach." The January 1974 issue of the satiric magazine National Lampoon was dedicated to animals: Pets, circus, wild beasts, evolution, law, etc. 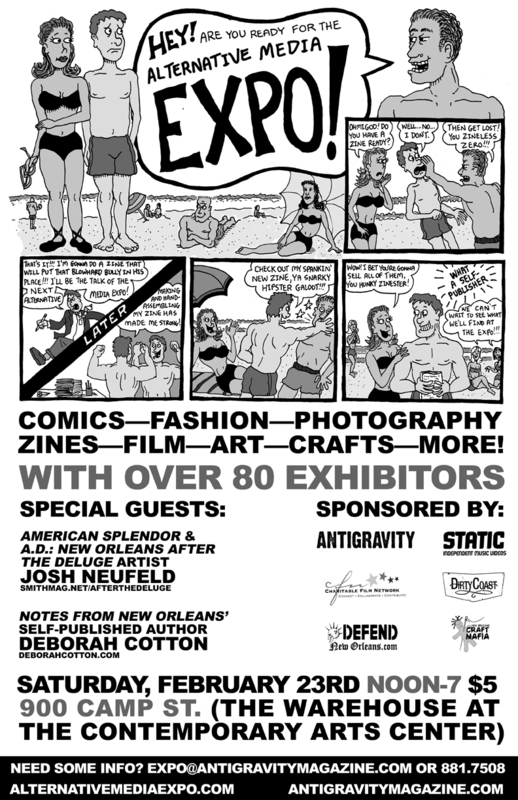 A fake advertisement in the article ‘’Popular Evolution’’, a parody of the magazine Popular Mechanics, presents in the three-stage comic strip manner a Charles Atlas-style commercial. A little skinny mouse suffers the humiliation of being kicked at the beach by a bully, some sort or medium-size carnivore. Little mouse, goes home, kicks a chair, fills the form and sends it to Mr. Charles Darwin, Galapagos Islands. “After a few millions years of evolutionary exercise” little mouse has developed fangs, and ugly scary face, wings, amongst other attributes; goes back to the beach, bites the bully predator in the neck, Count Dracula style and is declared the “heroe of the habitat” by the admiring females. Leider the issue is out of print and cannot be seen online anywhere. Flex Mentallo in Doom Patrol was supposed to be the character in the Charles Atlas ad. Several years later, Jeffrey C. Hogue, president of Charles Atlas, Ltd. sued DC Comics, particularly over issue #42, in which Mentallo's origin is told, in which the character literally arises straight from the ad. The court found that the statute of limitations had run out between the publication of the comic and the lawsuit, and that, because the comic book could not be considered an advertisement for something else, it was legally protected parody. 1 2 "Charles Atlas, the Body-Builder And Weightlifter, Is Dead at 79". New York Times. ↑ Kannenberg, Gene. "The Ad That Made an Icon Out of Mac," Hogan's Alley.. Retrieved August 6, 2008. ↑ "History, Travel, Arts, Science, People, Places – Smithsonian". smithsonianmag.com. 1 2 3 Jonathan Black (August 2009). "Charles Atlas: Muscle Man". Smithsonian magazine. ↑ Wallechinsky, D. (1996) The 20th Century History with the Boring parts Left Out. Little Brown & Co.
↑ Charles Atlas section of R. Christian Anderson's Sandow Museum website Archived September 14, 2008, at the Wayback Machine.. Retrieved September 30, 2008. ↑ Robertson, Stewart (January 20, 1939) "Muscles by Mail", Family Circle Magazine, Vol. 14, No. 3. ↑ "Eugen Sandow & The Golden Age of Iron Men". sandowplus.co.uk. ↑ "The Artistic Endeavor, toinelikesart: Pietro Montana Dawn of Glory,...". tumblr.com. ↑ Maeder, Jay (May 16, 1999) "Charles Atlas Body and Soul" Archived August 25, 2009, at the Wayback Machine.. New York Daily News. ↑ Where appropriate, such as in the UK, he was a pound heavier as a "seven-stone weakling". Oxford Advanced Learner's Dictionary. ↑ " Federal judge: Parody of Atlas man protected by First Amendment," Associated Press (August 31, 2000). ↑ Gaines, Charles and Butler, George (1982) Yours in Perfect Manhood, Charles Atlas: the Most Effective Fitness Program Ever Devised. Simon & Schuster. 1 2 Thomas, Carl (August 9, 2014) "Charles Atlas – The Worlds Most Perfectly Developed Man". RoutineCalisthenics.com. ↑ Woycke, James (2003). Au Naturel: The History of Nudism in Canada. FCN. pp. 3–. ISBN 978-0-9682332-3-8. ↑ '3a. The Seven Stone Weakling', David Hockney: Catalogue entry. Tate (December 18, 1963). Retrieved on 2015-08-29. ↑ Canberra Times cartoon Archived February 21, 2011, at the Wayback Machine.. Scratch Media. ↑ "Animals". National Lampoon. Marksverylarge.com (#46). November 17, 1997. Retrieved August 7, 2010. ↑ Sullivan, John (August 31, 2000). "Charles Atlas Complaint Held as Legal Weakling". The New York Times. ↑ "Grumpy Gamer Stuff and Things and Monkey Island". Grumpygamer.com. June 1, 2009. Retrieved August 7, 2010. 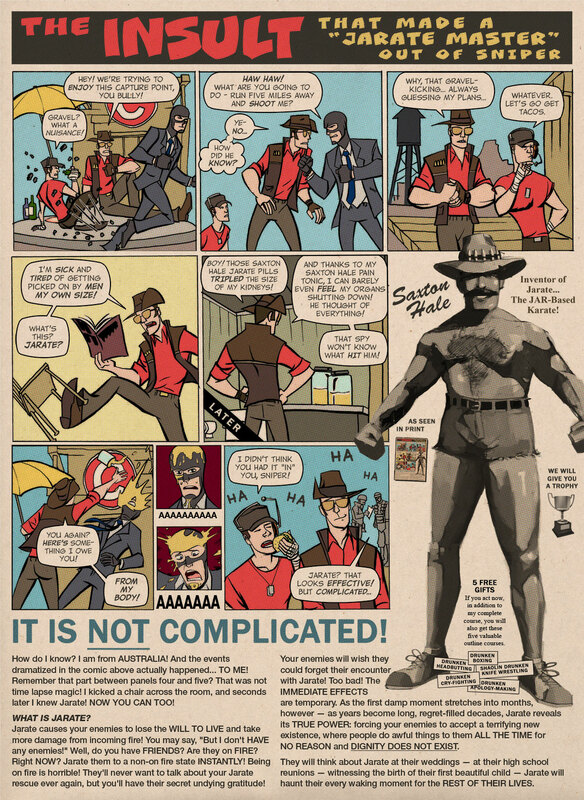 ↑ "Team Fortress 2 – Manniversary Update". teamfortress.com.